Garden landscaping is an important part of your overall landscaping process. The garden or gardens can often be a poorly designed area of a landscape. 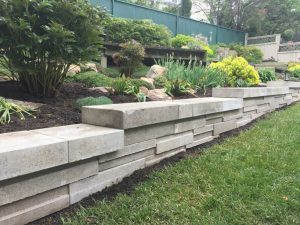 Many homeowners or landscapers will not thoroughly plan or think about the long-term growth of garden landscaping and the end result can be everything from overgrowth to a clash of colours, varieties, and species. Overcrowding and overgrowth in garden landscaping is probably the most common problem we see in local Calgary yards. The most obvious reason for this is because the garden was initially planted full with shrubs and/or perennials to make the garden look complete at the time of planting. The problem with this is of course that plants grow, and they continue to grow over many years. Unless you prefer a full garden to start with and then plan to remove or drastically prune back your shrubs, it is best to plant with future growth in mind. Using a landscaping professional can help you identify and understand the long-term growth of plant species. Keeping in mind, that with Calgary’s short growing season, the estimated growth may be somewhat less than is listed. Knowing the growth and eventual mature sizes of your plants can help you design the perfect garden. Garden Landscaping is often an afterthought and it really should be treated as importantly as any other aspect of your landscaping. As well, as causing you a lot of extra work, overplanting can cost you much more than you need to spend. Why spend more than you need to? only to have to pull out much of what you planted. You may have to settle for a less dense garden to start with but in the end, your garden landscaping and your plants will benefit from a well thought out garden. Plants don’t like to grow with no room for future growth so leave them plenty of room to get established and to mature. Take a little time to sketch out your garden landscaping and place in your plants allowing for future growth. This can be a fun part of your landscaping project even if you’re not an expert at sketching. It may take a few sketches and little research to understand the mature plant growth and how it will work with your particular garden landscaping but in the end, the planning will be well worth it.